My favourite heritage-related advertisement is for a castle that shall remain nameless (in itself an irony, as we shall see…). The over-exuberant marketing executive declares it to be ‘the most ruined castle in England’. But there are walls, doors and openings for windows… ruinous, certainly, but ‘most ruined’ requires a field devoid of anything, a blank canvas with no trace remaining of its presence. Zip. Zero. Nothing. My point is that the trajectory for the past is always towards complete ruination. Natural processes of weathering and decay play a fundamental part, but these are hastened by economic decline or growth, natural disaster, loss of relevance, apathy, even war. Churches and places of religious significance are witness to all these, indeed some more than others. At the same time they are hugely significant cultural markers, part of the fabric of life in the UK, whether you are a believer, atheist or agnostic. 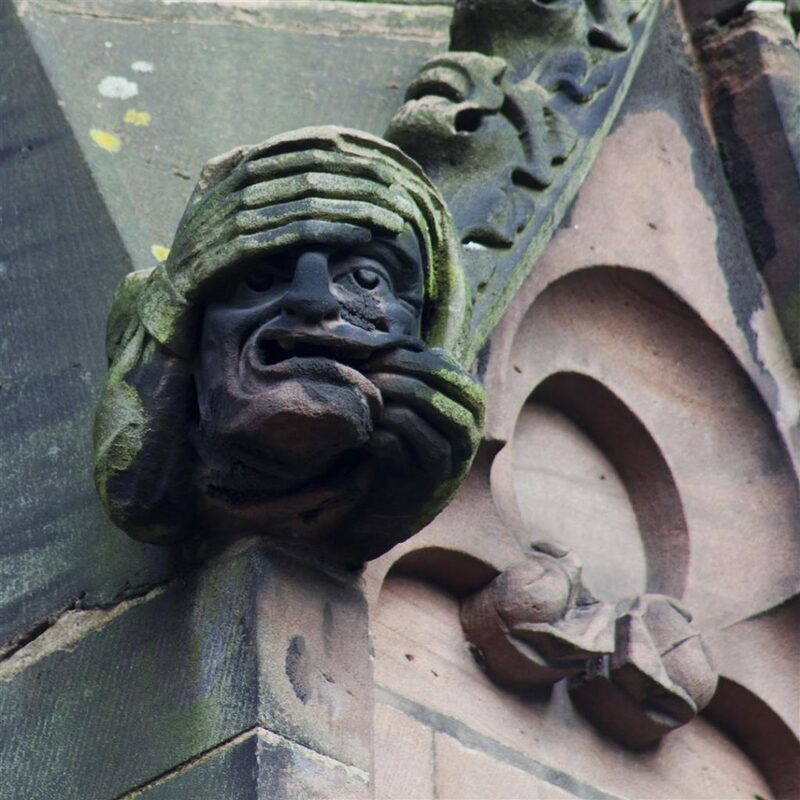 So the slowing down of that process of ultimate ruination, through conservation, restoration or even reconstruction makes for an interesting commentary on the value we place on culture. The role of religion in shaping the landscape of today’s society cannot be understated, irrespective of personal beliefs. In the UK nearly every village will have a church or chapel. The place-names in our countryside – glebe, kirk, capel, llan, stow – reflect that importance. Such is their ubiquity that the classic UK Ordnance Survey maps even distinguish between those with spire, tower or simple ‘place of worship’, whereas almost everything else is confined to the generic category of ‘building’, at best appended by ‘PO’, ‘PH’ or ‘TH’. In our larger settlements the skyline remains punctuated by the very same, albeit in our biggest cities this religious spire-scape is becoming gradually overgrown by secular towers to white-collar industry, designer-shards or functional masts to maintain our digital habit. Of which more later… Suffice to say that these earlier buildings are critically important punctuation marks in our history. Beyond the physical attributes of a church building, the influence of primarily Christian religious institutions in the UK is apparent everywhere from schools, colleges and agricultural systems (for example tithe barns, or vaccary and bercary landscapes: medieval cattle or sheep ranches) all the way through to courts, industrial complexes and model towns. This influence, whether current or historical, is an important part of the fabric of the UK. It contributes towards diversity and sense of place. It is part of the patina of location that makes Blackburn different from, Bournemouth or Birmingham. But, like any all heritage, churches and other religious places of worship are on that constant path to ruination. World Monuments Fund and World Monuments Fund Britain work to breathe new life into extraordinary heritage here in the UK and across the globe. Out of the 600 projects that we have worked on over the last 50 years, at least 300 have involved a church or sacred building, by far the largest percentage. Threats are numerous, and whilst some are indiscriminate in terms of the type of heritage that is affected, such as earthquakes, floods or fires, others may have a disproportionate influence, in particular the impact of conflict and the changing demography of belief, linked to a broader economic story. The destruction of religious sites has been much in the news over the last few years, be it the demolition of the Temples of Bal and Baalshamin in Palmyra by Daesh, or mausoleums in Mali, Shiite mosques in Mosul or Sufi shrines in Tripoli. Each in turn echoes the dynamiting of the Bamiyan buddhas in Afghanistan by the Taliban in 2001. Too often religious sites and places of worship are under increasing pressure from those with fixed ideologies. For some, heritage divides rather than unites and religious heritage divides more than secular. 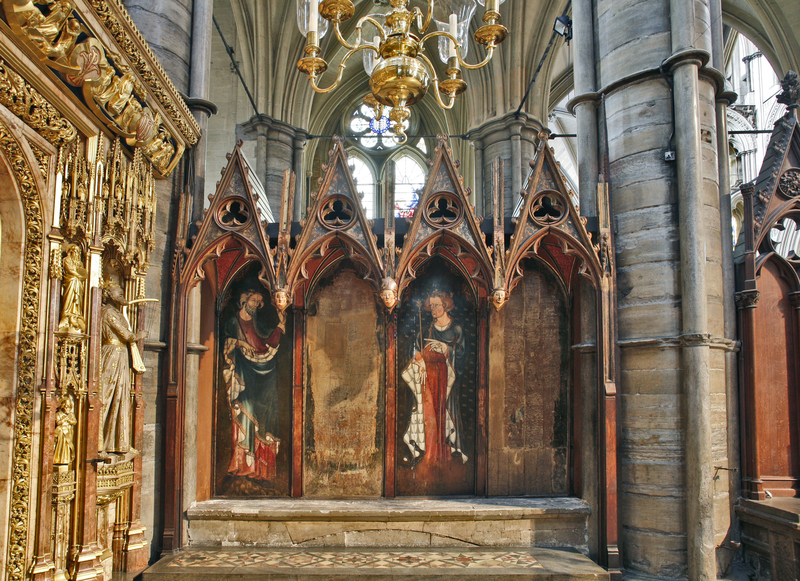 This is nothing new: in the heart of Westminster Abbey, a rare 14th century sedilia depicts two magnificent life-sized paintings of kings, alongside a further two panels stripped back to the bare oak. The panels once held images of saints. We have no idea who they were, because they were destroyed as “monuments of idolatry” in 1644, one of countless examples of the battles of religious iconoclasm from across the world. War and conflict take the headlines, but in reality a more common threat is from changing trends in religious belief, tethered to economics. 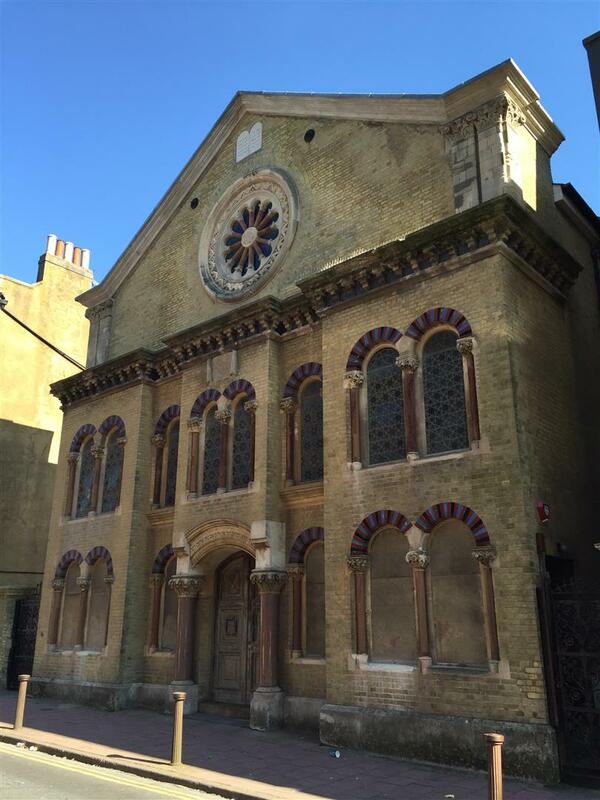 Middle Street Synagogue in the historic centre of Brighton is a magnificent Grade II* Victorian synagogue, constructed over 40 years from 1875 in a Romanesque revival style. 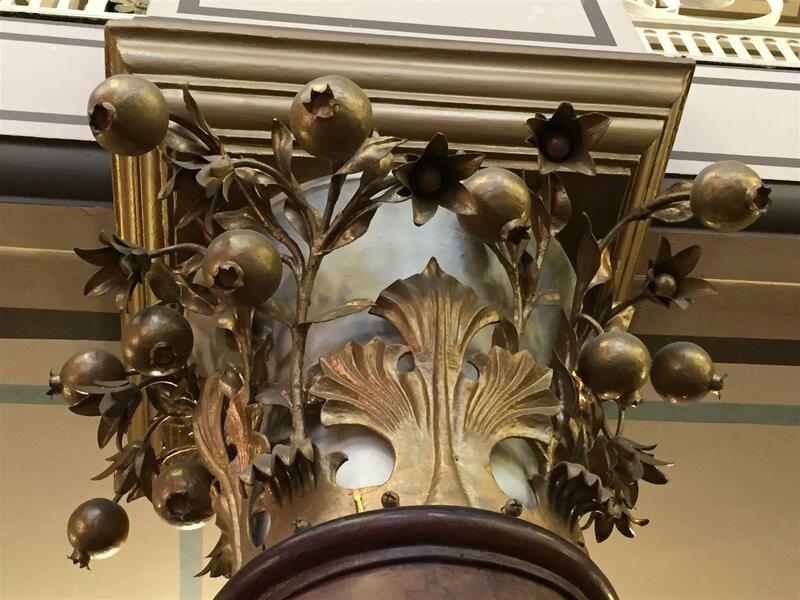 The interior is sumptuous, featuring iron capitals with plants and fruit from Israel, abundant gold leaf and mosaic, stained glass, fine joinery, lincrusta, marble, brass, stencilling, gilding, and scagliola. It represents the growing social status, aspiration and contribution of the Jewish community in Brighton in the nineteenth century. So why is one of Britain’s ‘top-ten’ (according to Jewish Heritage UK) in desperate need of conservation and a new role? Here is a story of economic geography. 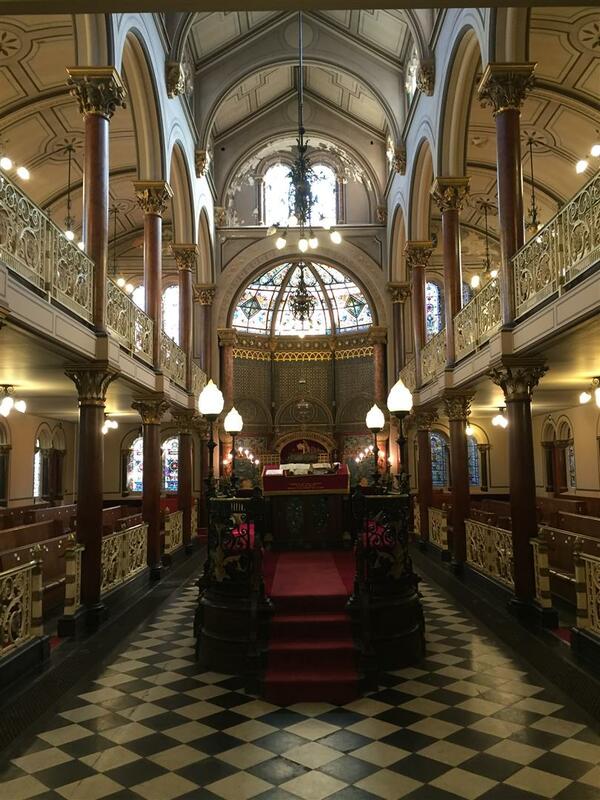 Prompted by greater freedom, emancipation and tolerance in the first half of the 19th Century, London’s expanding Jewish community sought new places to live and work. Brighton was a popular destination and well served by train from London’s East End. The increasing number of those settling into the town needed more places of worship, and Middle Street was the fourth synagogue to be built in a central location, like those before it. Fast-forward 100 years and Brighton has grown immeasurably, other synagogues have been constructed in the suburbs of the city, moving to where the congregation live as they too have relocated from the centre of town. The consequence is that there is no substantial local congregation any more for Middle Street. This, exacerbated by an absence of parking and modern facilities, has resulted in the search for a new purpose for Middle Street. It is a building marooned from its audience, and the same story plays out with churches and other places of worship. There are over 50,000 churches in the UK, 16,000 of them are listed. 1,700 churches have been made redundant since 1969, when the Churches Conservation Trust was established. And since then over 350 have been demolished. The difficulty of such a threat is that it is a slow, insidious process. A congregation rarely moves en masse, but gradually fades, and it is not until the elastic of a maintenance budget (high with an historic building) finally breaks that action is taken.